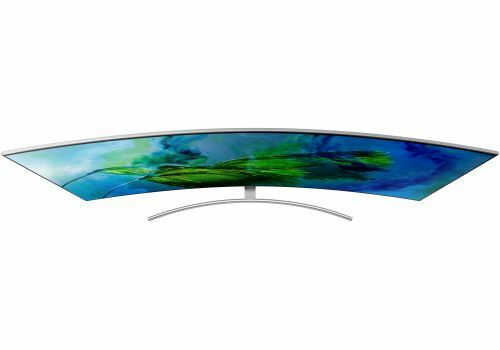 PAT PILCHER gets to grapple with and finally watch the latest curved beauty from Samsung. 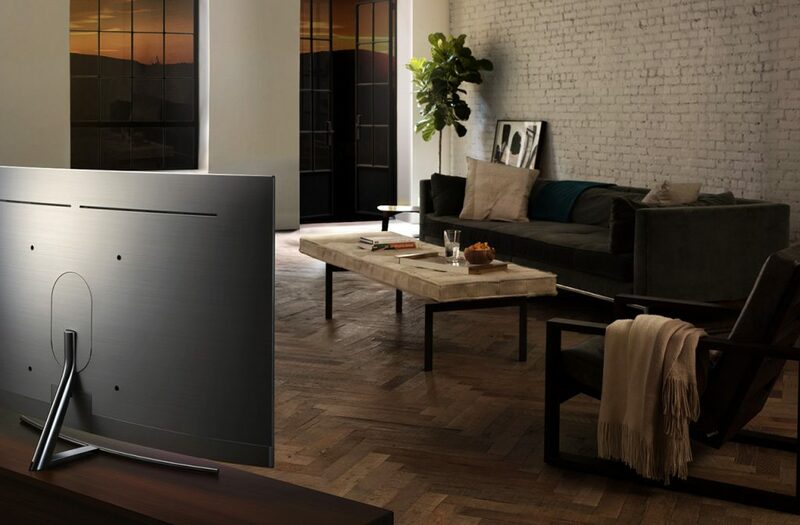 Samsung’s latest flagship TV is launching as a massive sea-change ripples through the TV market. 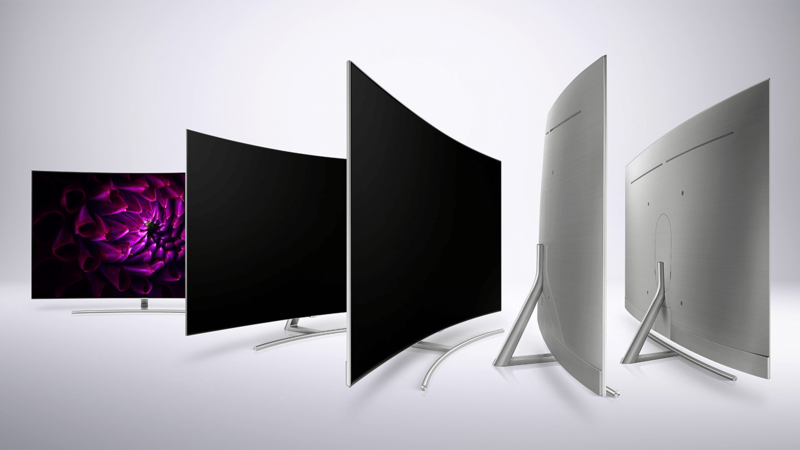 Some manufacturers are updating the technologies used in their screens: LG, Sony and Panasonic have moved to OLED (organic light emitting diode) displays, while Samsung are using quantum dot technologies to take their already impressive LCD TVs to the next level. 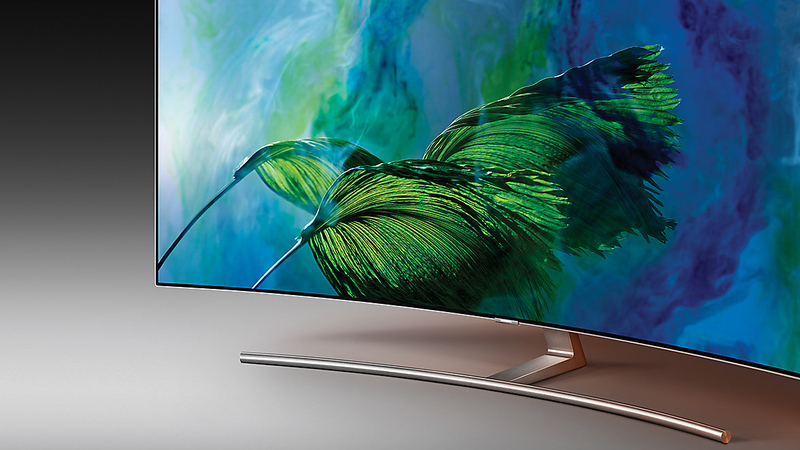 Samsung’s QE55Q8C – part of their QLED range – is an impressive beast, with its brilliant brightness, vibrant yet accurate colours and smooth image processing. At 55 inches diagonally, the Q8C is no shrinking violet. Its sheer size – 1226mm wide x 706mm High x 91mm – makes watching it feel a lot like being in your very own private cinema. 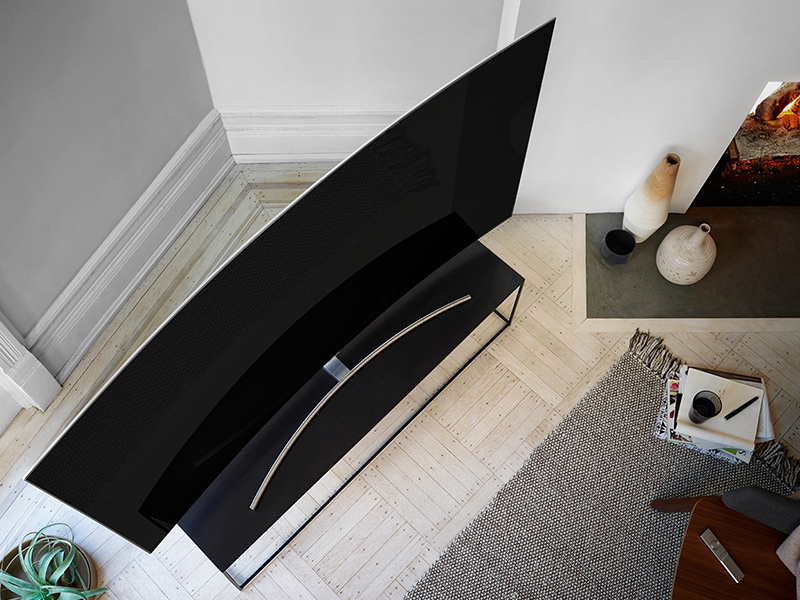 Here’s the thing though, clever design tricks such as its tiny bezel make it look thinner, so it doesn’t feel as if it dominates your lounge. This is also helped along by a metallic bar-style stand, which gives it a zero gravity look so it seems to be hovering above your TV cabinet. Around the back the Q8C is done out in a silver metallic rear finish and there are several pop-out panels for keeping cabling tidy. It’s a curvy thing, which might be an annoyance to some when it comes to wall mounting, and it also caught more glare and reflections in my lounge. The review unit came with Samsung’s minimalist ‘smart’ remote, which deserves special mention. It feels as if it’s crafted out of a solid piece of alloy, and sports just seven buttons. This minimalist design makes for a far less onerous learning curve, and it felt great to use compared to the usual bazillion button Tupperware monstrosities bundled with most TVs. It also did a surprisingly good job with voice commands. The Q8C supports 4K resolution content as well as several flavours of HDR (high dynamic range) video. Samsung deserve points for adding support for the new Hybrid Log-Gamma (HLG) format which is designed to be used for HDR encoded broadcasts. There’s also support for HDR10+ which is an open-source rival to Dolby Vision. HDR 10+ has just picked up support from Amazon video. For those technically inclined, the ‘QLED’ brand refers to a design improvement over existing Quantum Dot technologies that involves quantum dots being encased in a metallic compound, which means they deliver better colour performance at higher brightness levels. The result is super vivid video that looks very crisp. The Q8C’s connections are handled by an external ‘One Connect’ box, which has four HDMI ports, three USB ports, Bluetooth and Wi-Fi plus Ethernet for networking. DLNA is supported, and the USB ports can record video to USB hard drives from the Freeview tuner (as well as playback from USB storage too). An external connectivity box may sound old school, but there’s a method to this madness. Wall mounting a TV with multiple HDMI ports, an antenna, composite, S-Video and power cables usually results in untidy cable clutter running down the wall from the TV, which sort of defeats the purpose of wall mounting. The One Connect box provides a central location for cables, with all audio and video signals carried to the Q8C via a single tiny cable that’s wafer thin and semi-transparent. In use it all but disappears, especially when painted the same colour as the wall. That said, the effect is somewhat undone by the fact that the Q8C still needs a power cable at all. The Q8C’s user interface uses horizontal icons. These streamline access to content and video sources. When combined with the smart remote, driving the Q8C is an intuitive experience. In addition to the now mandatory Netflix, Amazon Video and YouTube, there’s also a growing pile of thierd party apps to choose from, including a Plex client. The Q8C is bright. Samsung’s blurb says it delivers a dazzling 1500 nits. This helps tease a lot of detail out in HDR-encoded content, and lends on screen content a real world feels so that in use watching the Q8C feels a lot like looking out of a window. Unboxing a 55-inch TV on one’s own isn’t a job for the faint hearted, and neither is getting the TV from the store to one’s home (the box is huge). The fiddliest job, however, involved mounting the Q8C onto its bundled stand. This required that the Q8C lie screen-down on the floor, where a rear panel was popped out and the stand attached and screwed in. As with most TVs, the screws seem to be made of a particularly soft metal, so using an old school hand screw-driver over an electric drill with screw attachments is advisable if you want to avoid stripping the screws. Once assembled, the power up installation routine saw the Q8C auto-tuning itself while I added apps and tweaked its settings. A particularly clever feature is the Q8C’s ability to auto-detect and label HDMI inputs of connected gear. It worked without a hitch for everything but my Boxee box. The Q8C also appears to put HDMI CEC (consumer electronics control) to good use. Recognised HDMI sources can be controlled using the TV smart remote. It’s a clever feature, but I still found myself reaching for other remotes out of habit. There’s also a pile of setting options for wringing the best possible video out of Q8C. The colour temperature in the standard colour mode was a tad too warm, but this was easily corrected. Similarly, non HDR encoded content was also able to be tweaked so it looked almost as good as HDR thanks to Samsung’s HDR+ setting. It tweaked both brightness and contrast as well as colour to deliver a convincing faux HDR look. Your mileage with will vary. With high quality HD or 4K content it worked well. With some SD content, it made some on-screen pictures look soft. As with other LCD TVs using local dimming, HDR encoded content did show some subtle banding (If you looked close enough). Tweaking the Calibration Night setting mostly remedied this. Another bug bear with LCD is motion judder, and here Samsung has really delivered the goods. On screen motion for fast moving objects or camera pans was silky smooth with no discernible edge artefacts or the dreaded soap opera effect that makes film sources look like video. All told, video on the Q8C impressed, showcasing just how far LCD technologies have come. On screen pictures can be incredibly bright, and vivid. For an LCD TV, the contrast levels are also astonishing. This is no small deal either, as most kiwis watch TV with the lights on or in a sunny lounge. The Q8C isn’t fazed by ambient in-room light, smashing through it to deliver peeper pleasing video. I’ve yet to see another LCD TV that looks as vibrant and crisp under daylight conditions. HDR and local dimming issues were about the only negative and even then, they were barely noticeable. If you have a TV room that gets a lot of sun, the Q8C and its excellent Smart Remote may be just what the doctor ordered, especially when paired with UHD/HDR capable Blu-Ray player, Netflix or Amazon video services.